Animals tend to bring out the best in their human counterparts. They have the ability find the good in us all, never judging even in our lowest moments. PADDINGTON 2 continues the rich legacy of the titular bear’s soft brand of charm with ease by finding the silver-lining in every situation. Director Paul King returns to the lived-in world of Paddington, filled with adorable British manners and a cast of characters that are the cherry on top of this sundae-like feature. This is a perfectly adequate sequel that legitimately ups the stakes from its predecessor, all the while staying true to the spirit of what made the first film great. Paddington (voiced by Ben Whishaw) has settled in with Mr. and Mrs. Brown (Hugh Bonneville and Sally Hawkins) and their two kids Jonathan (Samuel Joslin) and Judy (Madeleine Harris). The marmalade sandwich-wielding bear has become a pillar to the community, helping the residents of their quaint English block find love and laughter. The film is filled with set-pieces that place our mischievous protagonist working as a barber, cleaning windows and running from the police while riding a dog. All of this is an effort to save money to buy his Aunt Lucy a special pop-up book for her 100th birthday. There is a little more action that I would like in a film about a talking bear, yet the quirks avoid delving too far into cartoonish fare. King throws us into this world using a pop-up book, zooming in and out of famous London landmarks. Its a fully immersive tone that is lovingly crafted and uses creativity for the sheer joy of it. There is an embarrassment of talent on-screen here — including Hugh Grant’s rendition of a devilishly amusing villain, whose plan to steal the coveted pop up book lands Paddington undeservedly in prison. In addition to Grant, Brendan Gleeson (HARRY POTTER series) plays a hard-nosed prison chef, while old favorites Julie Walters (HARRY POTTER series), Jim Broadbent (HARRY POTTER series) and Peter Capaldi (not the HARRY POTTER series) are back in the cast. PADDINGTON 2 works as the ointment for all the troubles in the world. This bear becomes a superhero in his own right using the power of charm and goodness to overcome his family’s problems and save the day. All this marmalade will help sweeten your day while the film stays young at heart, but never panders to its viewers. The whole family can learn how to accept others from this little bear. Paddington has proved that he’s a timeless character that’s the cure for any gloomy day. 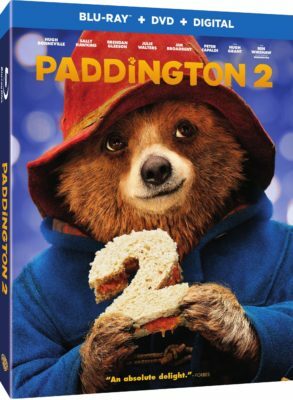 PADDINGTON 2 is n0w available on Blu-ray, DVD and Digital HD. How To Make Marmalade: As if PADDINGTON 2 wasn’t enough to spark your sweet-tooth, now you have a Paddington’s famous marmalade recipe in your home. The Magical Mystery of Paddington’s Pop-Up Book: This immersive book shows the technical craft that went into making the film. The Browns & Paddington: A Special Bond: Focusing on the chemistry behind the bear and the actors who bring the film to life!